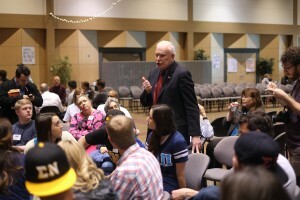 Four hundred people representing virtually every part of the Chico community attended a gathering on the Chico State campus last Friday to collaborate on actions we can take to change Chico’s increasingly out-of-control drinking culture. Attendees ranged from the Chico State and Butte College student bodies, fraternities and sororities, parents and University officials, to members of the Chico City Council, Chico Police and EMTs, to downtown bar owners, retail sellers of alcohol, apartment building owners, as well as a healthy dose of average Chico community members like me. After the introductory speeches, we were introduced to a professional mediator brought in to facilitate the conversations. I must admit, I was skeptical at first. She had a serious hippy mediator vibe and used a lot of fuzzy language. She introduced us to what she called “open space technology,” which is like the Montessori of meeting formats, as in, this is your meeting, follow your passion. It starts with anyone and everyone proposing a topic, getting up and giving a one or two sentence introduction to their topic, and posting it on a giant bulletin board of sorts. I was surprised to see so many people jump up and propose topics for discussion. There was so much passion and interest in this topic and everyone seemed to have ideas to bring to the table. Some in attendance scoffed at the proposed methodology at first, but in the end, it worked beautifully, and I think everyone felt like they had their chance to be heard. There were three sessions in all, with each session divided into several breakout groups discussing a given topic. Topics included “Why should the University recognize frats at all?”, “The role of the media and advertising”, “How can local business help?”, “Early intervention in K-12 and the importance of parental responsibility”, and “Alcohol and sexual assault”. Each of these discussions was vibrant—full of intelligent ideas and well-informed, respectful dialogue. I was most interested in hearing from students. I believe any true change in student culture must be driven by the students themselves. I’m not 18 anymore, but I remember well that this is an age defined largely by opposition to parents and authority figures. Nobody likes being told what to do, but this is especially true when you are in college and forging your identity. I couldn’t agree more. We need a much deeper integration between the Chico business and arts communities and the student body, providing not just internships where they are treated as free labor, but long term mentorships. This not only provides productive channels for youthful energy that might otherwise be put into a night of drinking, but it provides a deeper connection and incentive to stay in Chico, growing the local economy and building a virtuous cycle of creative energy.